The Netherlands funds numerous Israeli and Palestinian NGOs directly through government entities including the Ministry of Foreign Affairs (MFA), the Embassy in Tel Aviv, and the Representative Office in Ramallah (NRO), and indirectly by outsourcing to Dutch church groups and aid organizations, such as ICCO and Oxfam-Novib. 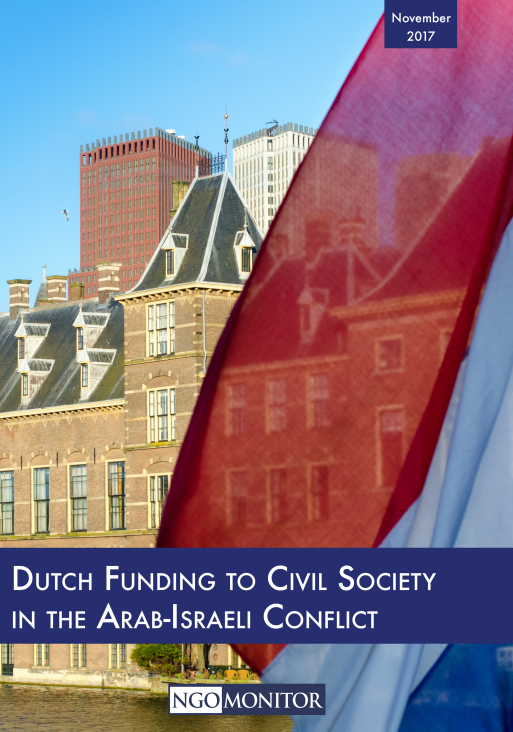 Since 2016, the Dutch government has provided approximately €65 million in direct and indirect funding to NGOs operating in Israel, the West Bank, and Gaza. The Dutch Representative Office in Ramallah (NRO) funds both Palestinian and Israeli NGOs. Grantees include the Union of Agricultural Works Committee (UAWC), Al Mezan, the Palestinian Working Woman Society for Development, Breaking the Silence, B’Tselem, Gisha, Bimkom, and Yesh Din. Al Mezan is highly active in anti-Israel lawfare campaigns, exploiting courts and international legal bodies to seek arrest warrants against Israeli government officials, file lawsuits against companies and governments doing business with Israel, and lobby for cases against Israelis at the International Criminal Court (ICC). Breaking the Silence makes sweeping accusations based on anecdotal, anonymous, and unverifiable accounts of often low-ranked soldiers. These “testimonies” lack context, are politically biased, and erase the complicated reality of asymmetrical warfare. In addition, they reflect a distorted interpretation of the conflict in order to advance the political agenda of Breaking the Silence activists, thereby fueling the international campaigns against Israel. Gisha employs “apartheid” other international legal rhetoric to promote a partisan political and ideological agenda. Bimkom regularly files petitions in an attempt to alter government policies related to spatial planning, planning procedures, and Bedouin communities. Yesh Din is central to the allegations that Israeli investigative and court systems are unable or unwilling to investigate allegations of wrongdoing and is part of a wider “lawfare” strategy of pressing “war crimes” cases against Israeli officials in foreign courts and in the International Criminal Court (ICC). These campaigns use faulty information and skewed statistics to promote their political claims. The Embassy in Tel Aviv does not publish details on NGO funding. According to information submitted by Israeli NGOs to the Israeli Registrar of Non-Profits, the Embassy allocated NIS 606,591 to Israeli NGOs from 2016-2018. Public Committee Against Torture in Israel (PCATI) received NIS 140,441 (2016). The Union of Agricultural Work Committees (UAWC), in partnership with the Land Research Center, Palestinian Hydrology Group (PHG), and the Economic & Social Development Center of Palestine, received €8.4 million (2013-2018) from the Ministry of Foreign Affairs. UAWC is identified by Fatah as a PFLP “affiliate,” and by USAID as the “agricultural arm” of the PFLP. Land Research Center claims that the Balfour Declaration “placed a toxic dagger in Palestine that aims at restricting the advancement of the Arab Nation and disconnecting its east from its west,” and is part of a “continuous conspiracy.” LRC outlines “the conspiracy in years,” which also includes the American war in Iraq, the “Fatah-Hamas conflict,” and the Arab Spring. Palestinian Hydrology Group is part of Stop the Wall, a grassroots network organization engaged in BDS and delegitimizing Israel through international advocacy. Diakonia’s “International Humanitarian Law” (IHL) program, which has its own online “Resource Center,” exploits international law, demonizes Israel, and promotes anti-Israel lawfare campaigns and a narrative based solely on Palestinian victimization. The IHL program focuses exclusively on Israel; Diakonia does not conduct similar types of programs in terms of content or resources involving any other conflict region in the world. Diakonia “Partners” with a number of NGOs that promote BDS and lawfare campaigns against Israel and even blatant antisemitism, including: BADIL, Sabeel, Al-Haq, Alternative Information Center (AIC), B’Tselem, and Al-Mezan. The Dutch Ministry of Foreign Affairs has also provided funding to Israeli NGOs, Comet-Me and B’Tselem. Comet-ME received NIS 4 million (2017) from the Dutch MFA, as part of a €2.39 million grant (2017-2020). Comet-ME also received a grant of €494,962 (2016-2017) from the MFA. In 2013-2018, the Netherlands provided over €3.7 million to the Secretariat, out of €3.9 million appropriated (2013-2018). The Secretariat funded highly politicized NGOs that promote BDS campaigns and engage in legal warfare against Israeli officials and companies that do business with Israel. Some of these NGOs have close ties to the Popular Front for the Liberation of Palestine (PFLP), a terrorist organization designated as such by the U.S., EU, Canada and Israel; promote blatant antisemitism; distort facts; advance a “1948 agenda”; exploit the false “apartheid” analogy; and undermine peace and contribute to radicalization. NGOs that received Secretariat core funding include Addameer, Al-Haq, Al Mezan, B’Tselem, BADIL, Breaking the Silence, Defense for Children International – Palestine, Palestinian Center for Human Rights, and Yesh Din. Large-scale indirect funding for political advocacy NGOs is channeled through Dutch aid-organizations, most frequently Oxfam-Novib. Other aid-organizations include: Interchurch Organization for Development Cooperation (ICCO), Kerk in Actie (KIA), PAX, and the Catholic Organization for Relief and Development Aid (Cordaid). NGOs in Israel, the West Bank, and Gaza have received over €13 million since 2012 through this form of indirect funding from the Dutch government. Oxfam-Novib received €126.8 million from the Dutch government (2015-2017). Oxfam-Novib is also head of the IMPACT alliance, which received €373.7 million from the Dutch government in 2011-2015. Oxfam-Novib’s projects in Israel, the West Bank, and Gaza listed as “active” (as of December 2018) have combined budgets of €9.5 million. Oxfam-Novib supports the Palestinian Center for Human Rights (PCHR), Adalah, Al Mezan, Bimkom, Coalition of Women for Peace, Culture and Free Thought Association, Emek Shaveh, Gisha, HaMoked, MIFTAH, Palestinian Agricultural Relief Committees (PARC), Palestinian Medical Relief Society, Palestinian Working Women Society for Development, Applied Research Institute Jerusalem (ARIJ), The Coalition for Accountability and Integrity – AMAN, Union of Health Work Committees (UAWC), Women’s Affairs Center (WAC), Womens Centre for Legal Aid a Counselling (WCLAC), Women’s Studies Center, Yesh Din, as well as other “undisclosed” partners. Interchurch Organization for Development Cooperation (ICCO) received €19.6 million in 2016 from the Dutch government and provided over NIS 3 million to Israeli NGOs from 2012-2016. Following the loss of MSFII funding, ICCO’s funding to Israel, the West Bank, and Gaza has decreased significantly. In 2016, ICCO provided NIS 43,168 to Who Profits, according to information submitted to the Israeli Registrar of Non-Profits. ICCO no longer lists Israel, the West Bank, or Gaza in the list of countries it operates in, or in its list of projects. According to its 2016 Annual Report, Amman, Jordan is the only country in the Middle East in which ICCO operates. Kerk in Actie (KIA) runs projects co-financed with the government, but does not detail which ones. KIA partners include Rabbis for Human Rights, Ecumenical Accompaniment Programme in Palestine and Israel (EAPPI) and Sabeel. From 2012-2015, Cordaid funded 23 projects in Israel, the West Bank, and Gaza, with a total budget of €4.7 million. The majority of the funding allocated by Cordaid was provided by the Dutch Ministry of Foreign Affairs via the MSFII program. The projects were all completed on or before December 31, 2015. Cordaid has funded Ma’an Development Center, Israel Social TV, Culture and Free Thought Association, Mada al-Carmel, Sadaka Reut, Baladna, and Kayan, among others. PAX (formerly IKV Pax Christi) received €9.9 million from the Dutch government in 2015-2016 through the MSFII funding program. PAX was chosen in “2015 as a strategical partner of the Ministry of Foreign Affairs.” In 2016, PAX received €12.8 million from the Dutch government. Pax does not disclose funding to Israeli or Palestinian NGOs. In response to a letter sent by NGO Monitor regarding the funding of a group that inaugurated a youth center named after a terrorist, the Dutch Ministry of Foreign Affairs clarified that, in cooperation with the other donor countries of the Secretariat, the Netherlands has decided to suspend cooperation with WATC until further notice. An in-depth analysis of the Dutch Policy and Operations Evaluation Department Report. Will the Dutch Government End Funding for Anti-Peace BDS Organizations? NGO Monitor writes to Dutch officials regarding the conflation of true human rights groups and political advocacy NGOs within the nominees for the Tulip Human Rights Prize, and the biases of the judges for the Prize.